There are people who say that God is very harsh, that He is very hard to follow. But the problem is they have a faulty view of God. I never had a dad growing up, but I will tell you this: I have known my heavenly Father for a while now, and He always has dealt with me in love and never has been inconsistent. I don’t always understand (or even agree with) what my Father in heaven does. But I have submitted to Him because I know He is looking out for my best interests. In Luke 19, Jesus told a parable about a nobleman who went away and entrusted some of his servants with an equal amount of silver to invest while he was gone. When he returned from his journey, one of the servants told him, “Master, I hid your money and kept it safe. I was afraid because you are a hard man to deal with, taking what isn’t yours and harvesting crops you didn’t plant” (verses 20–21). Even when the day of reckoning arrived, there was no sense of regret on the servant’s part and no sorrow over his lack of productivity. In fact, he actually blamed his boss for his shortcomings. A lot of people today are like that servant: It is not my fault. . . . All of my teachers are bad. . . . All of my bosses are bad. The proper motivation for serving the Lord should be a love for Him. Is there credible evidence that Jesus really is the Son of God? 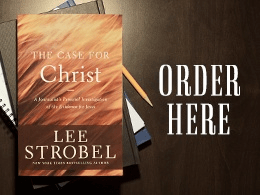 Retracing his own spiritual journey from atheism to faith, Lee Strobel, former legal editor of the Chicago Tribune, cross-examines a dozen experts with doctorates who are specialists in the areas of old manuscripts, textual criticism, and biblical studies.